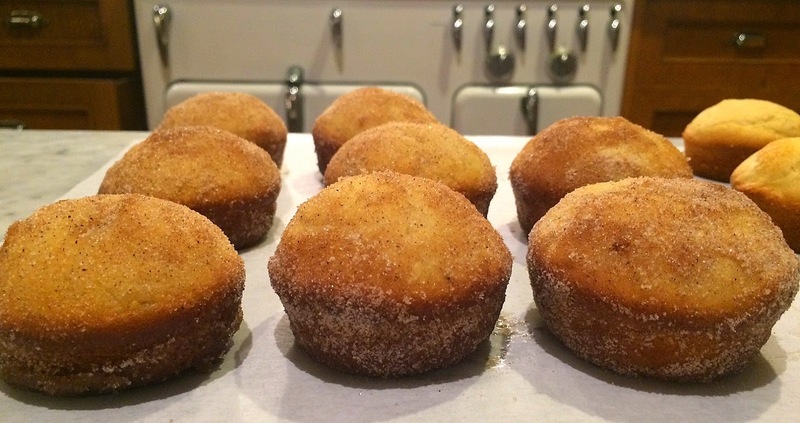 French Breakfast Puffs are not French and they are not puffs, but they are delicious, easy to prepare and very unusual (as in, how have I not encountered these before?). 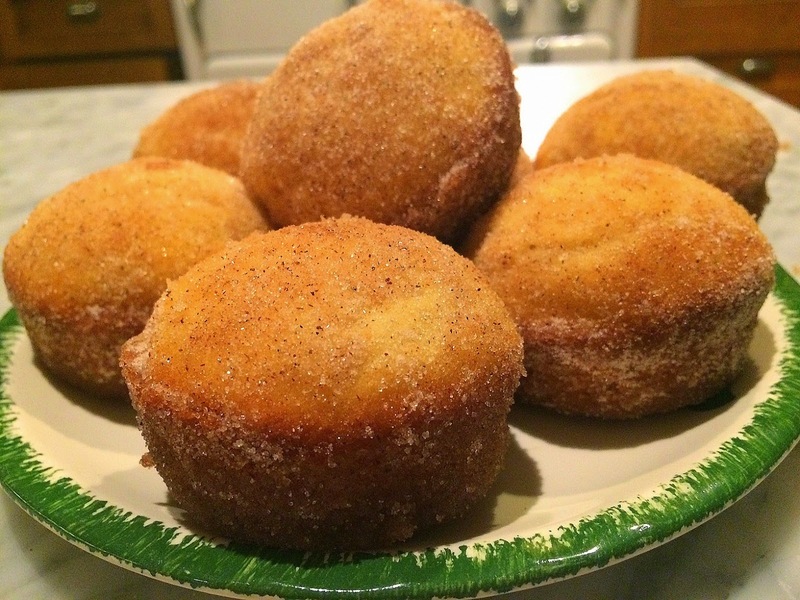 They are muffins that are dipped in melted butter and rolled in a cinnamon-sugar mixture right out of the oven -- and it's that coating that makes them so special, almost like a doughnut, but without the bother of frying. If you awaken just 45 minutes before the rest of your family, you can have these ready for them to enjoy -- they are that quick to make. But I'm told they're good the next day, too, according to my Henry Street Settlement colleagues who had the "leftovers" from my Thursday night baking adventure for breakfast Friday morning. 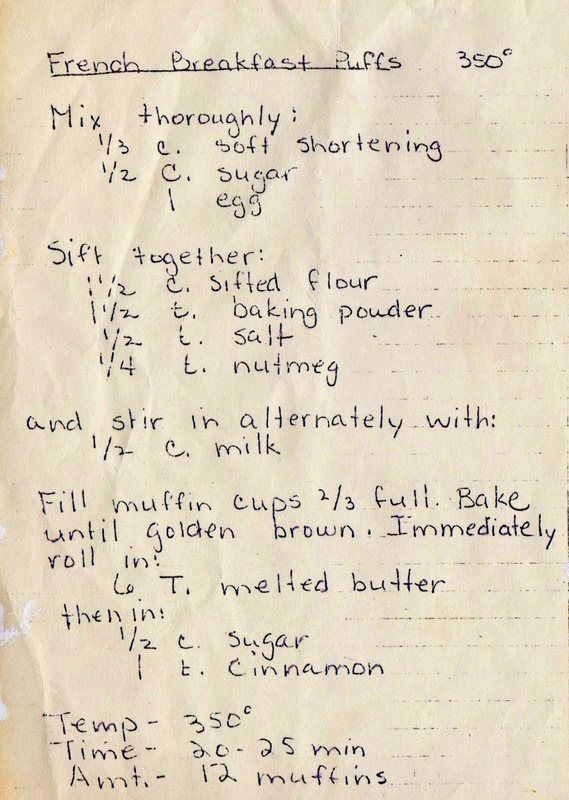 I found this recipe, probably dating from the 1950s, in a large collection of family recipes I purchased from an estate in Texas. 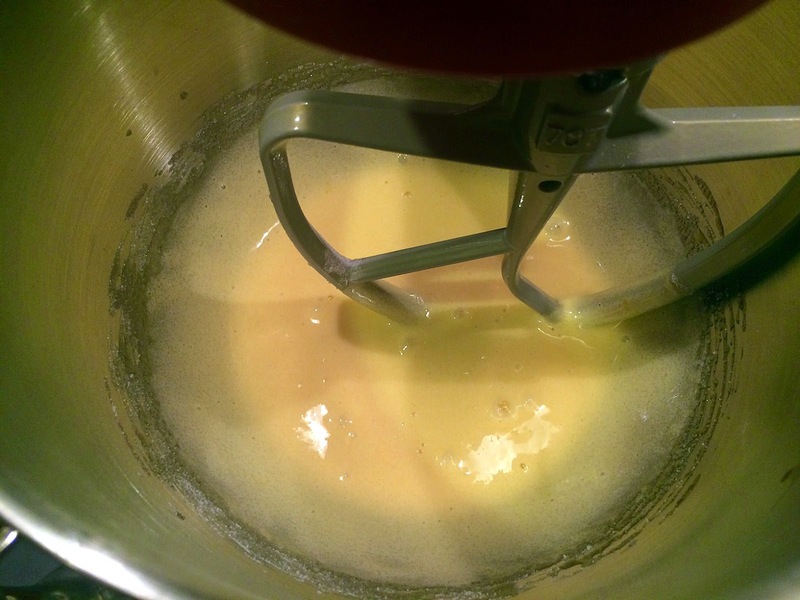 Begin by creaming the butter, sugar and egg. 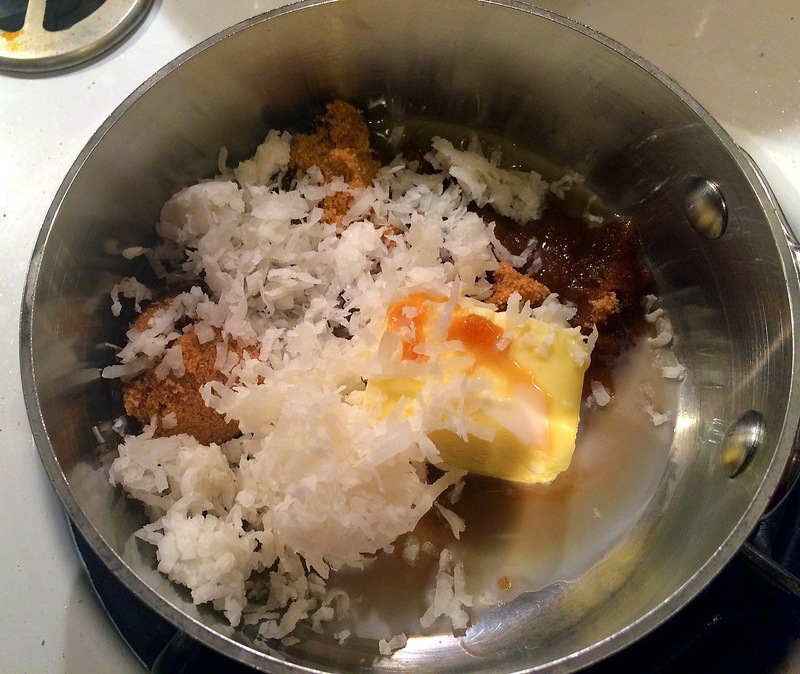 Mix the dry ingredients in a small bowl and have the milk handy. 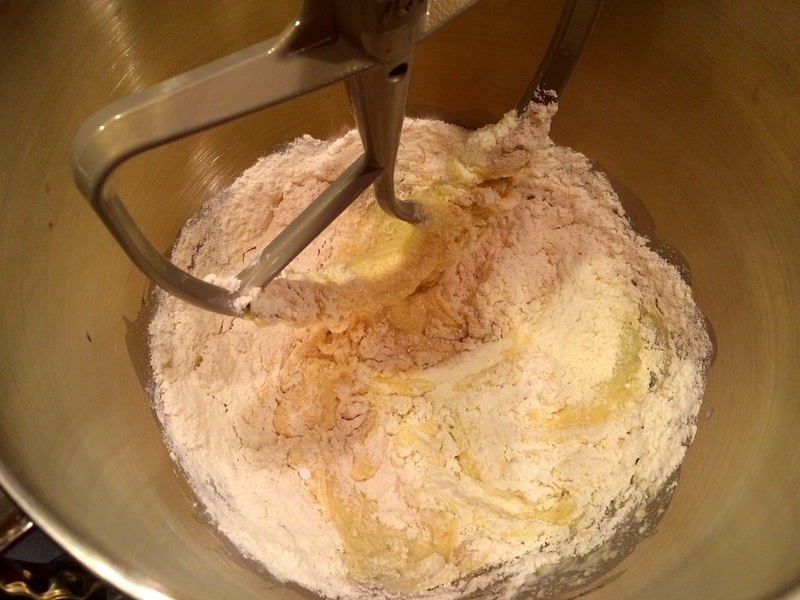 When the mixture is well combined, add the flour alternately with the milk, beginning and ending with the flour. 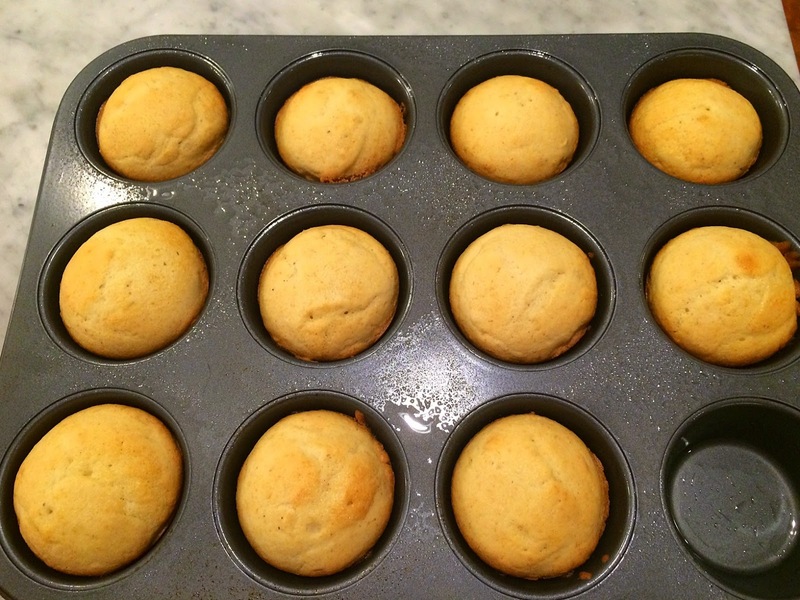 Spoon the batter into greased muffin tins. 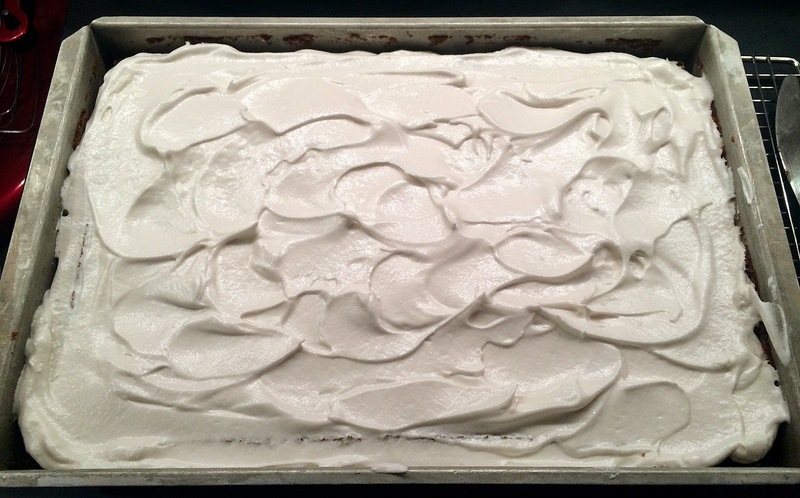 Don't line the tins with paper, and don't worry about smoothing the tops, as this will happen naturally in the oven. Bake for 20 to 25 minutes. These won't color a lot. 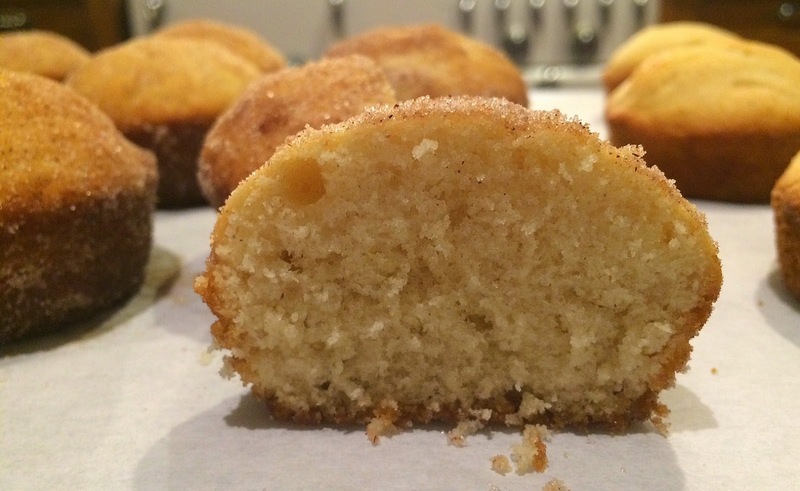 While the puffs are baking, melt the butter and mix the cinnamon and sugar together. 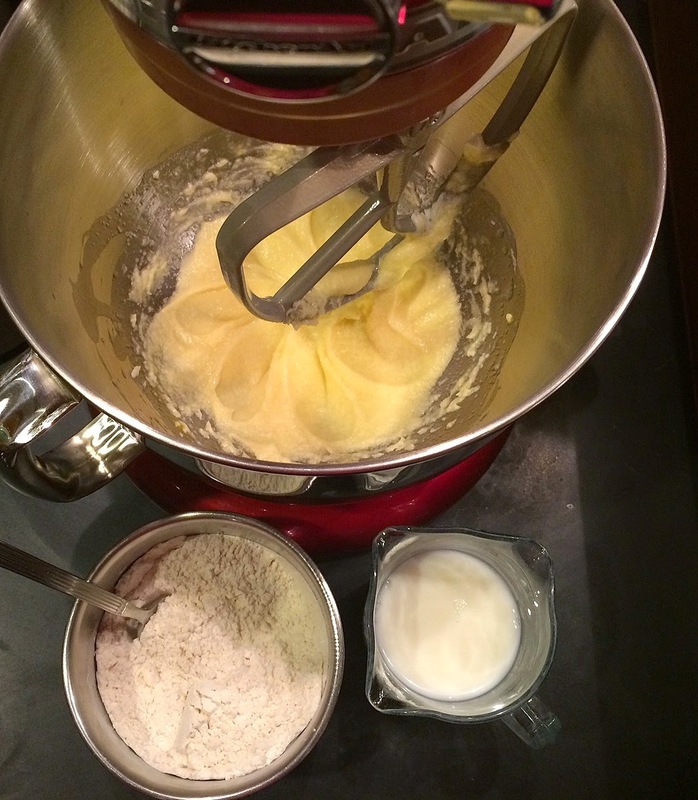 As soon as the puffs are done, roll each in the butter to coat, then into the sugar mixture. These are dense, almost like a cake doughnut. Production notes: I followed the recipe exactly, but used butter instead of soft shortening, and 1 percent rather than whole milk, because that's what I had on hand. When alternately adding the flour and milk, start and end with the flour. 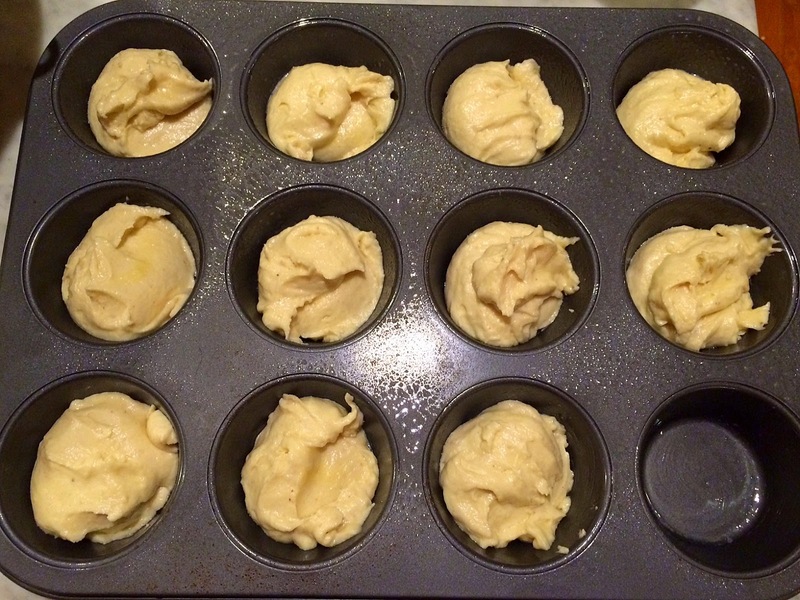 As you can see in the photos, this did not make enough batter to fill all 12 muffin tins -- only 11. And perhaps I saturated the muffins too well in the melted butter, because it ran out after I completed the eighth muffin! So if you want to make 12 muffins, fill the tins about half (not 2/3) full and melt about three extra tablespoons of butter for the final coating. 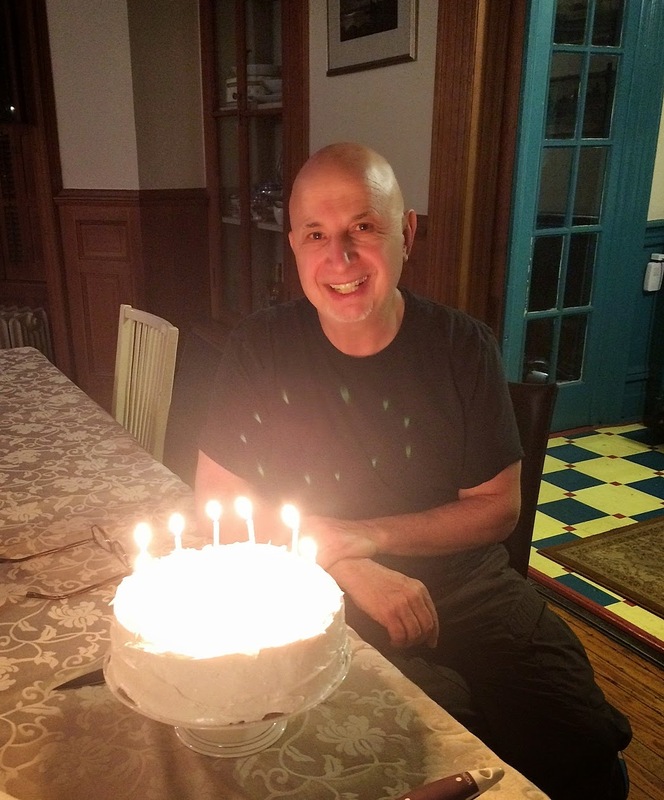 We celebrated the DH's birthday on Saturday with a cake made from a recipe that's probably a bit older than he is. 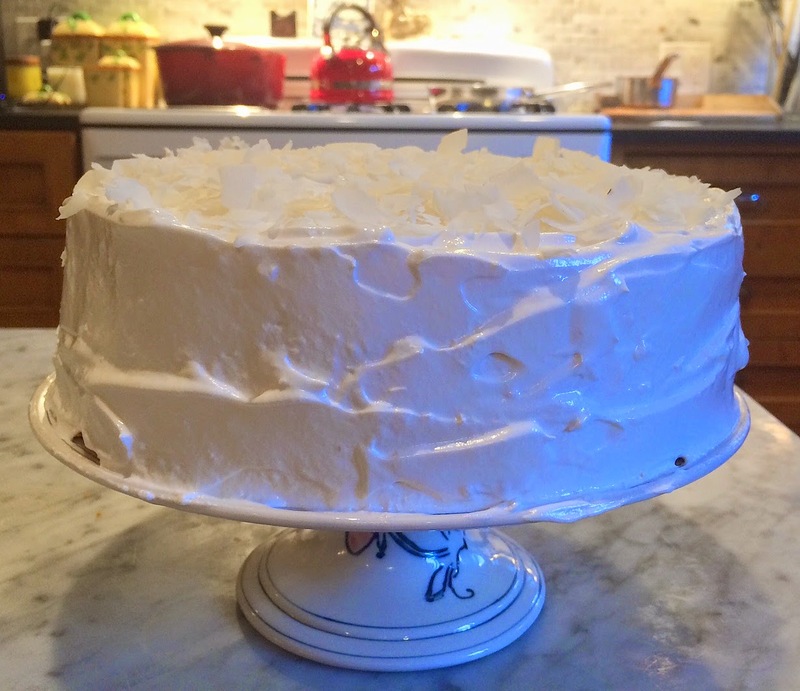 White Coconut Cake (his request) is an old-fashioned white cake (meaning only egg whites, no yolks). 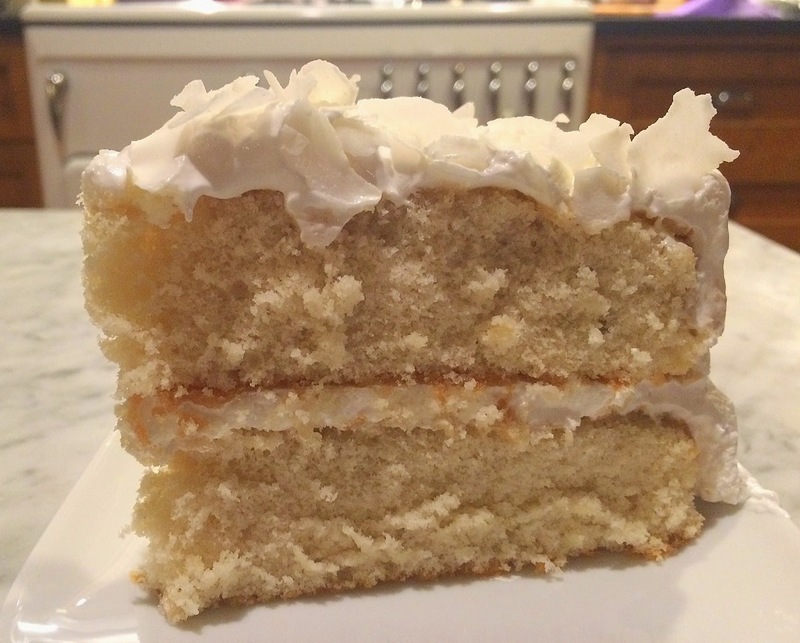 The only coconut is the shredded variety that's placed atop the frosting. 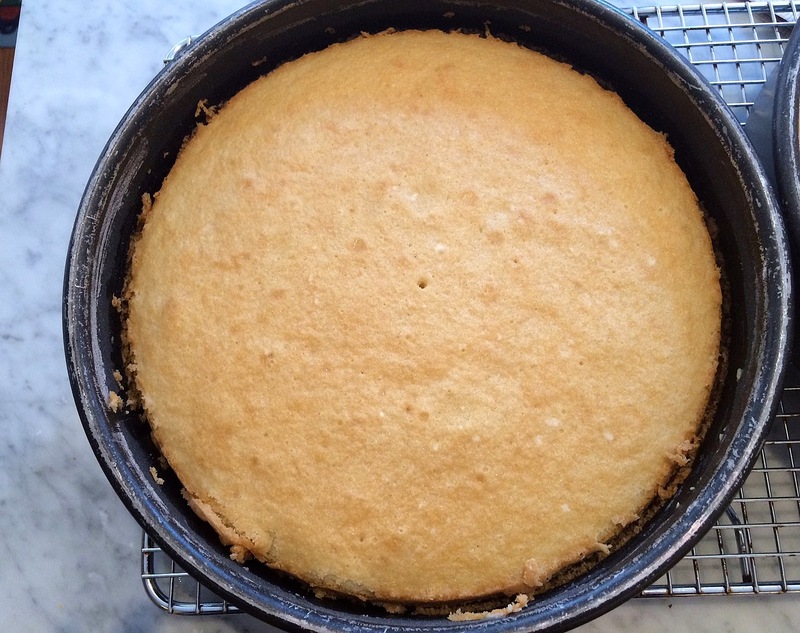 This is the first time I've seen a cake recipe calling for egg whites that are added directly to the batter without whipping separately, a real time (and bowl) saver. It's a very easy cake. In fact, I prepared it while the DH was taking one spin on his bike around Prospect Park -- it's that quick to make. 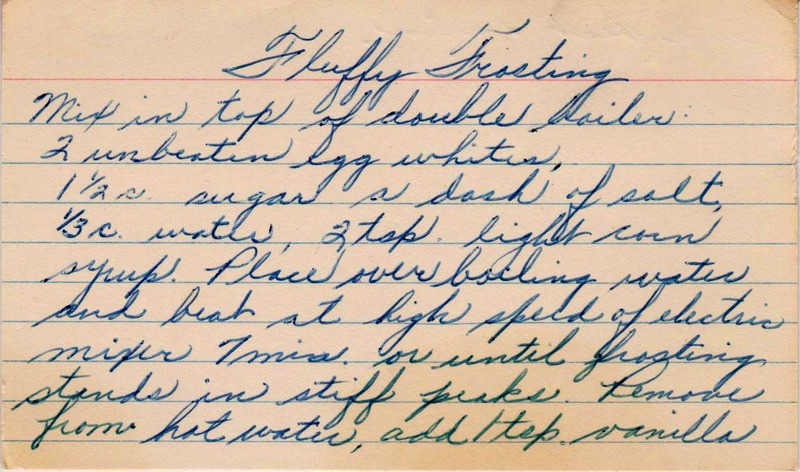 Mrs. Dumford, the recipe's author, suggested a seven-minute frosting, and I found one, called Fluffy Frosting, in my collection. 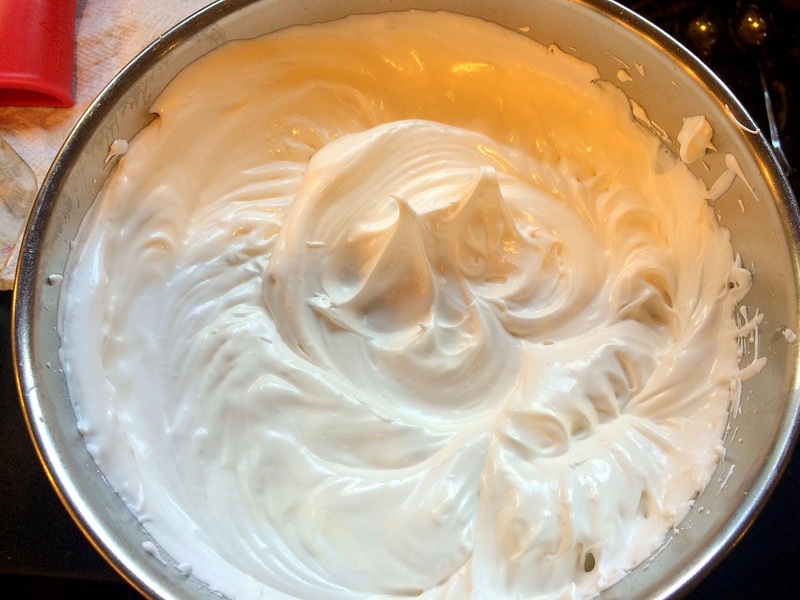 Seven-minute frosting, once a standard in mid-20th century kitchens, has fallen out of favor (often replaced with "buttercream" made from butter and confectioner's sugar), but it does have its appeal. It contains no butter -- just egg whites, sugar, corn syrup and water. 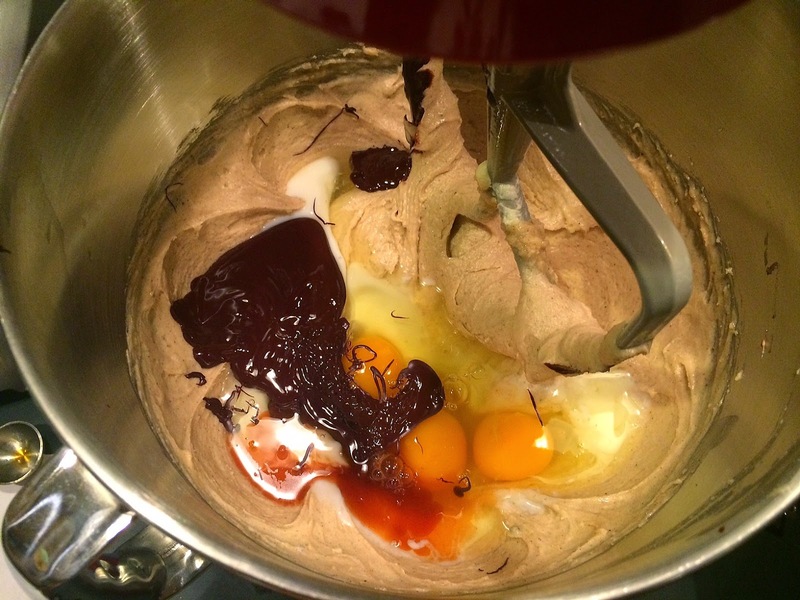 The magic happens during the seven minutes of whipping the ingredients in a double boiler. The result? Everyone (family members, and special guest Andrew, the DS's friend and a champion dessert eater) thought I'd frosted the cake with marshmallow fluff! Whole Foods, where we'd shopped that morning, didn't have grocery store sweetened coconut, so I bought the large flaked unsweetened coconut, organic (of course!). 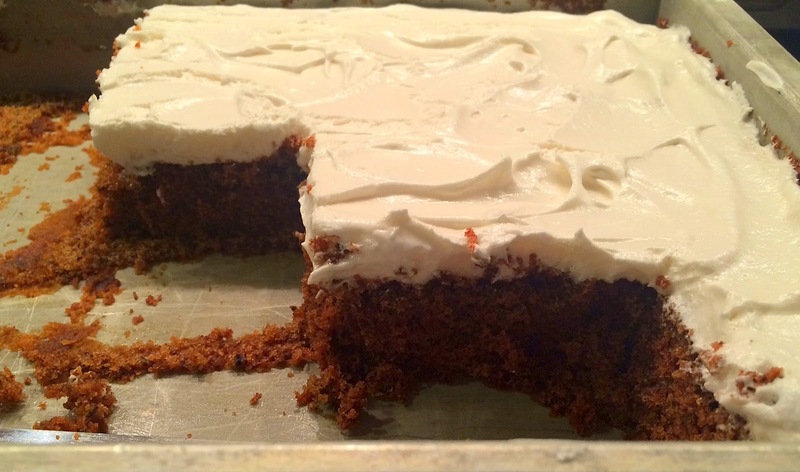 It worked perfectly, as the cake and frosting were pretty sweet, just like the DH. 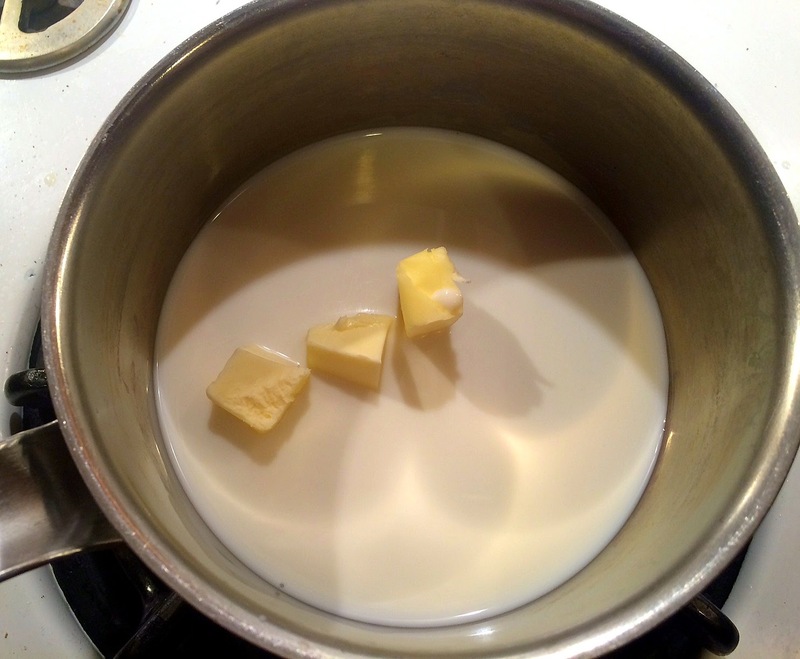 Begin by creaming the butter and sugar. Mine didn't get as "light as whipped cream" as Mrs. Dumford instructed, but it didn't matter. Add in the unwhipped egg whites. 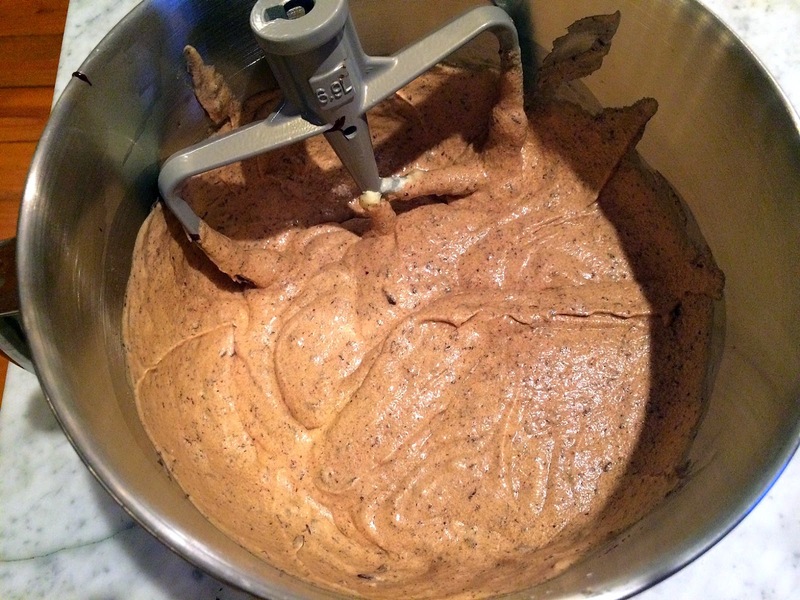 The batter is thick, so coax it to the pan edges, using an offset spatula, butter knife or the back of a spoon. After 20 minutes, test the cake with a toothpick. If it comes out clean, the cake is done. If not, bake another five minutes or so. 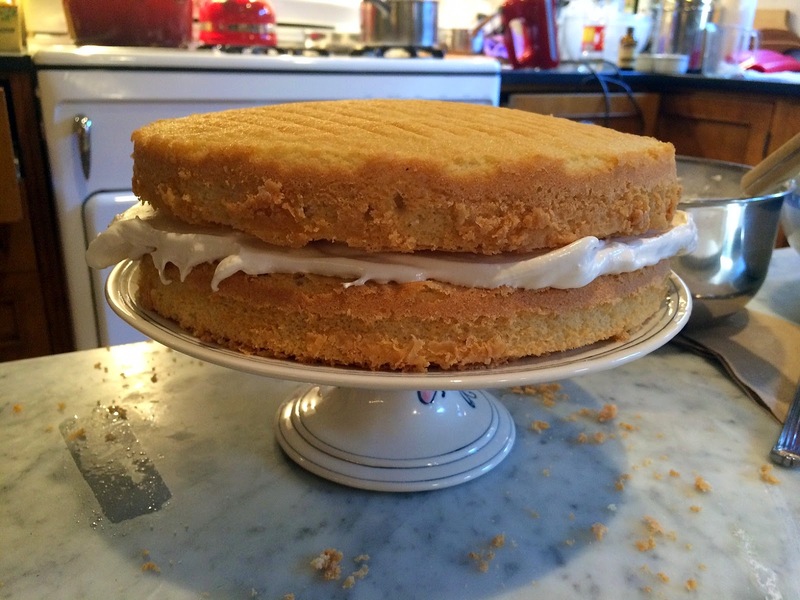 I failed to take photos of the frosting in progress. It's easy, but tedious, as the cook needs to stand over a hot stove while mixing it for seven loooong minutes or until it holds stiff peaks. 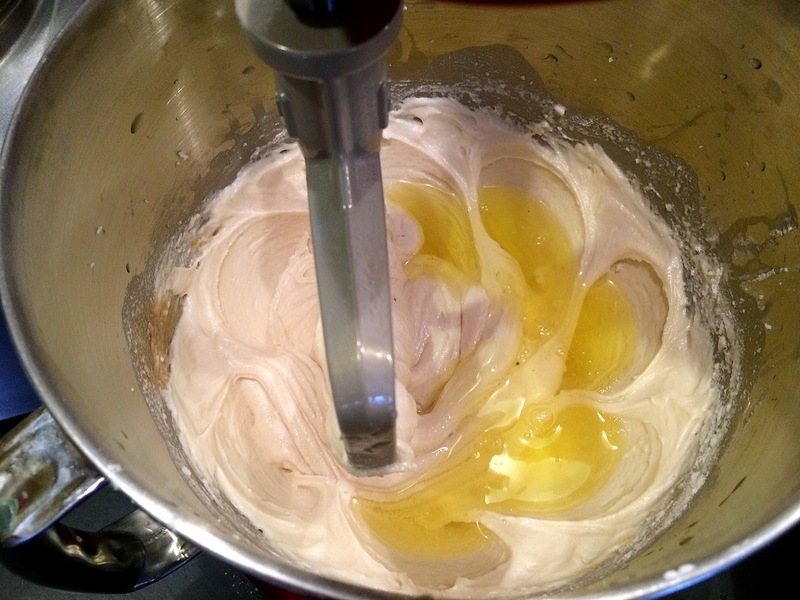 Production notes: I followed the recipe exactly, adding in the lemon extract and vanilla at the end. 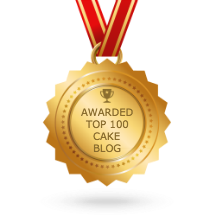 I also didn't beat as vigorously as instructed because overbeating can result in a tough cake. Be sure the butter is at room temperature. I baked it at 350 F for 25 minutes. I followed this recipe exactly. After the vanilla is added, beat for another minute or so. 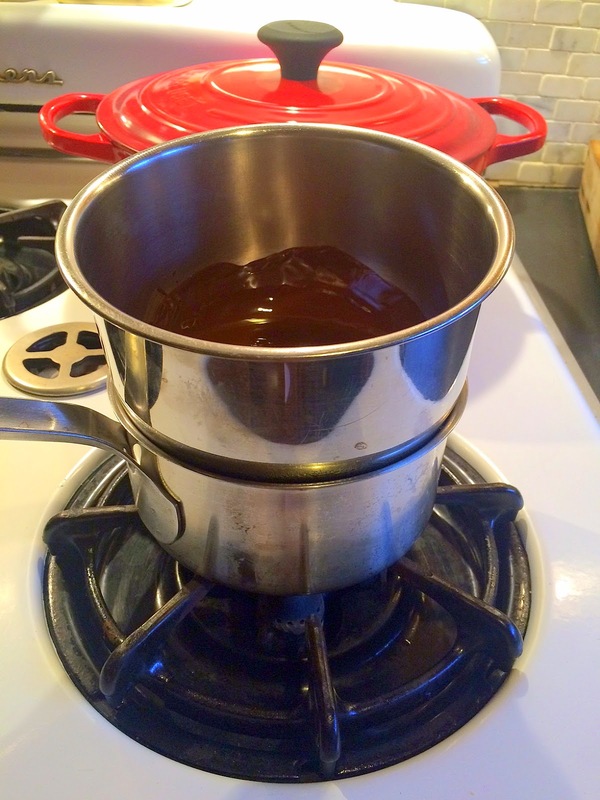 I also don't have a double boiler, so I fashioned one by placing a bowl over a saucepan of boiling water. This would make enough for a three-layer cake. Birthday celebration, and the birthday boy. Lazy cake (or baker)? I think not. 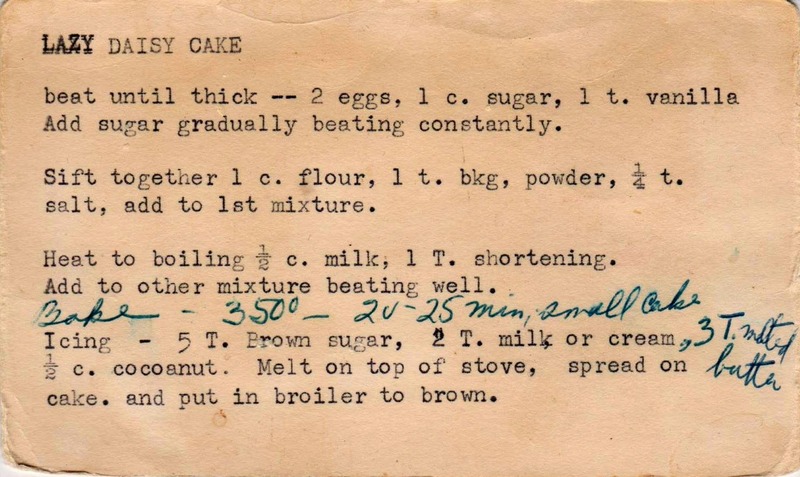 Maybe lazy for the 1940s when Lazy Daisy Cake debuted, but not these days. 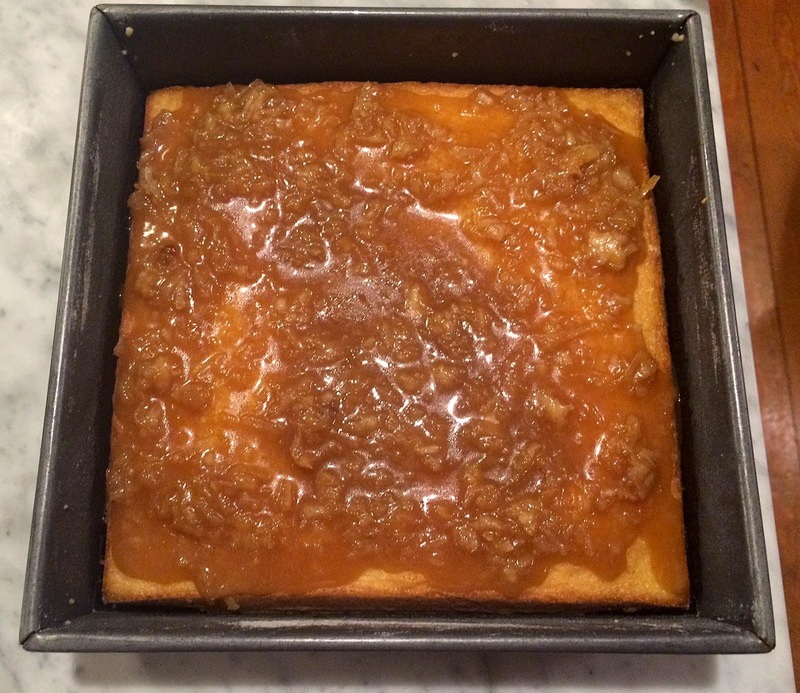 This is a scratch cake, requiring more effort than opening a box. 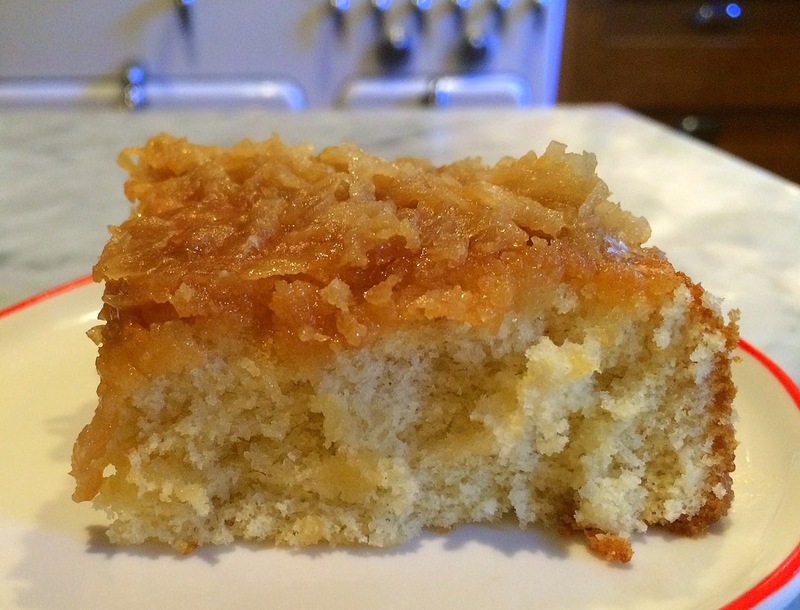 But not that much more, and the result -- a rich yellow cake with a caramel coconut topping -- is worth it. 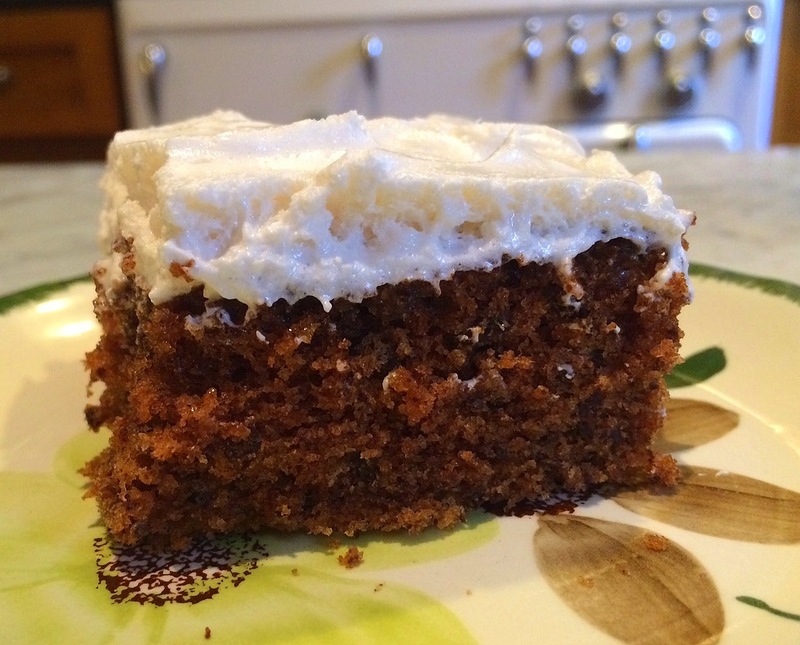 Perhaps it was considered "lazy" in the past because the cake does not call for a traditional frosting, which often involved seven minutes of beating egg whites into submission, sometimes without the luxury of an electric hand-mixer. 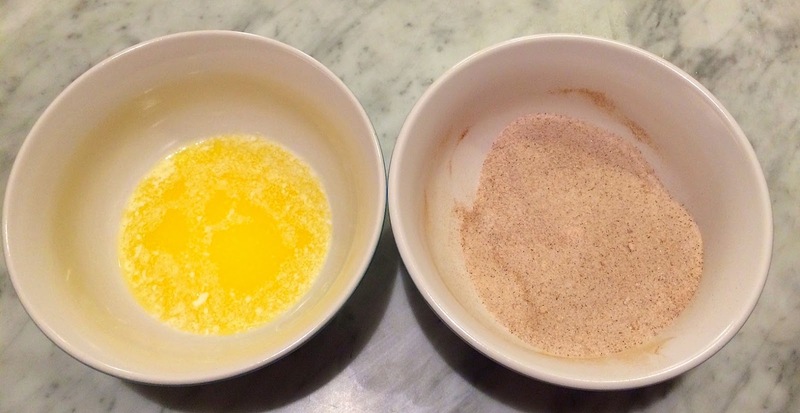 So if you want to go old-school (and I know you do), start by combing the dry ingredients, and setting them aside while you mix the eggs and sugar. Don't let the egg-sugar mixture sit without stirring! 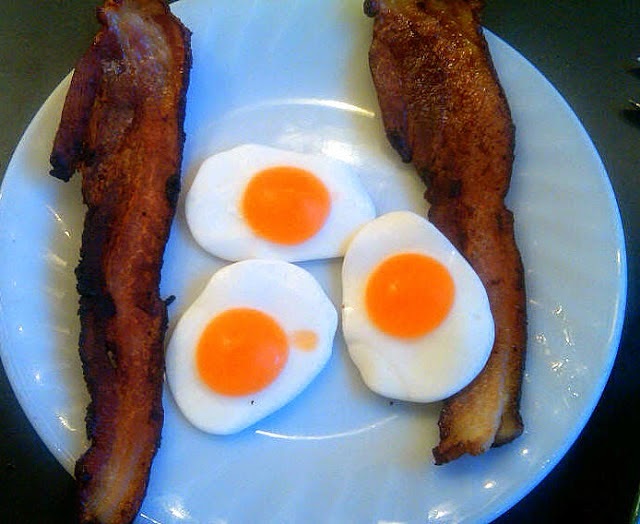 Several years ago, I learned the hard way that the sugar "cooks" the egg yolks if not immediately mixed. After the flour mixture is added, bring the milk and butter to the boil, and add it to the batter. 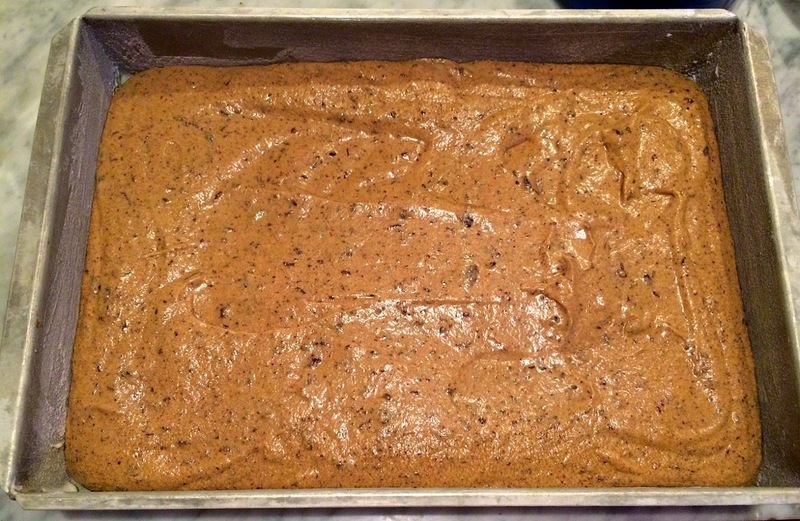 Pour the batter into a greased and floured 8 x 8 inch pan. Bake for about 20 minutes, until a tester comes out clean. While the cake is baking, prepare the topping by melting the ingredients together in a small saucepan. Spoon the topping over the hot cake, and spread out as best you can. 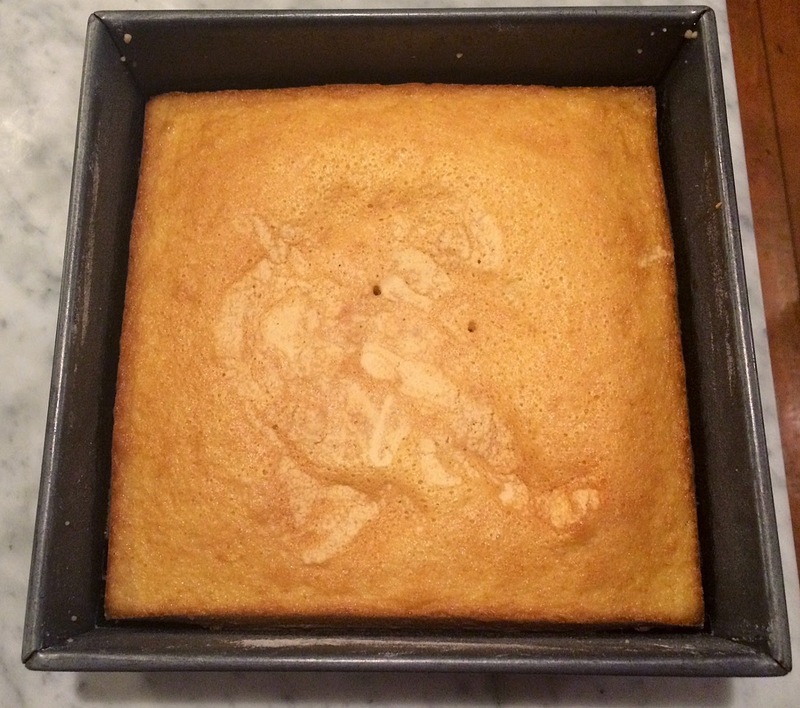 Place the cake under the broiler. 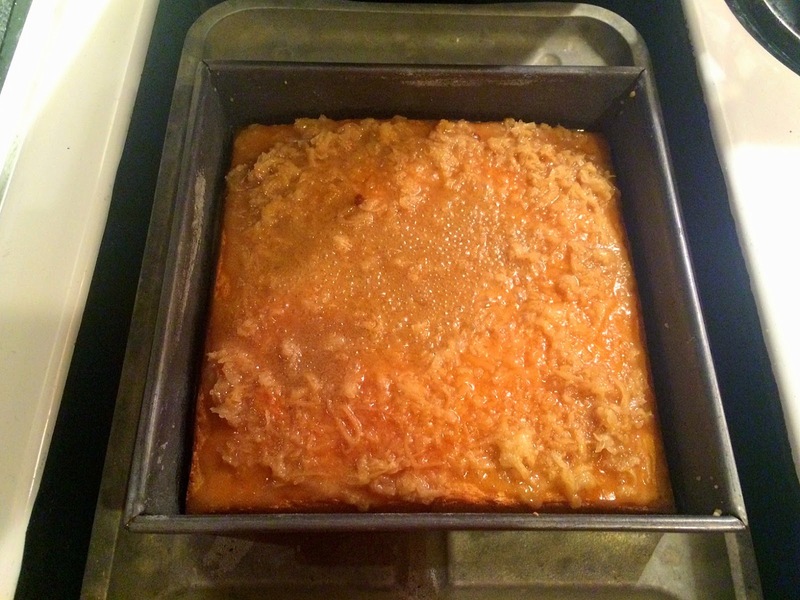 And broil until the topping is bubbly and begins to caramelize and color. Production notes: I followed the recipe exactly as written, but since it's a bit jumbled, I rewrote the method to make more sense. Enjoy! Preheat oven to 350 F. Grease and flour an 8 x 8 inch pan. 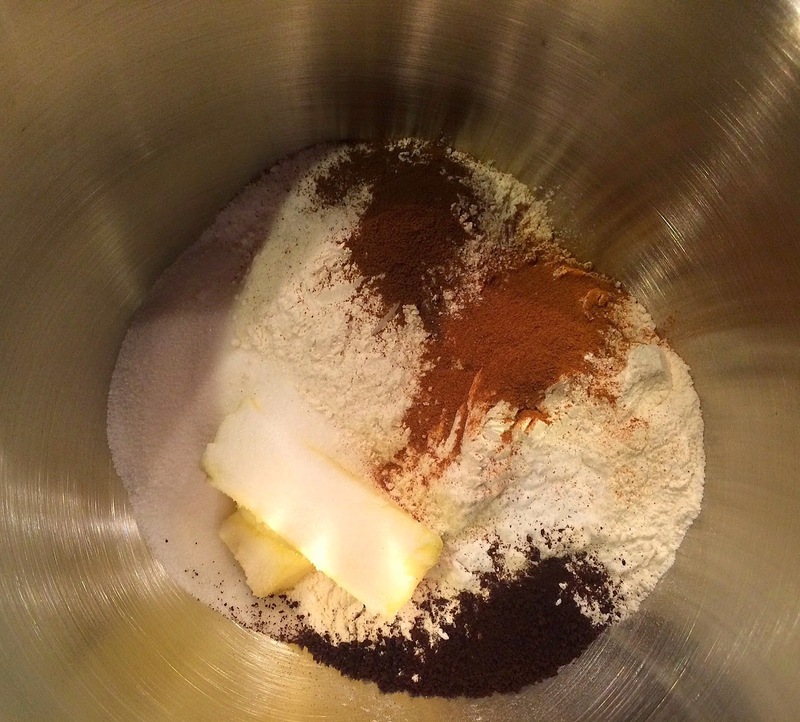 Cake: Stir together flour, baking powder and salt. Set aside. Beat two eggs until thick, gradually add 1 c. sugar, beating constantly. Add 1 t. vanilla. Heat 1/2 cup milk and 1 T. butter to boiling point. Pour into prepared pan and bake 20 to 25 minutes, or until a toothpick tester comes out clean. While cake is baking, prepare topping. Melt all topping ingredients in a small saucepan on top of stove. 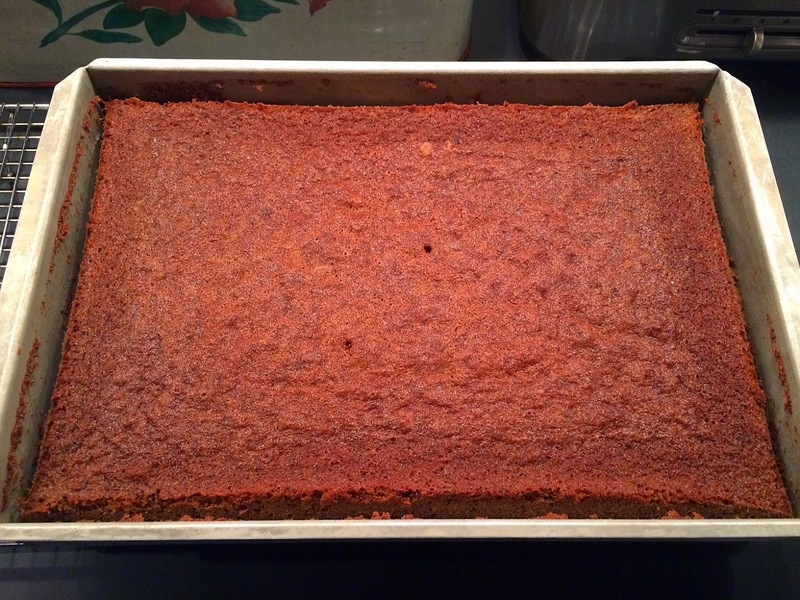 When cake is removed from oven, spread topping on hot cake. Boil for a few minutes until topping bubbles. Remove from broiler, cool and enjoy. One of the best things about a personal blog is that there's no boss, no deadlines, and if you don't feel like blogging, no problem. Or so I thought until yesterday when I was "berated" by my former boss. "When are you going to post something new! 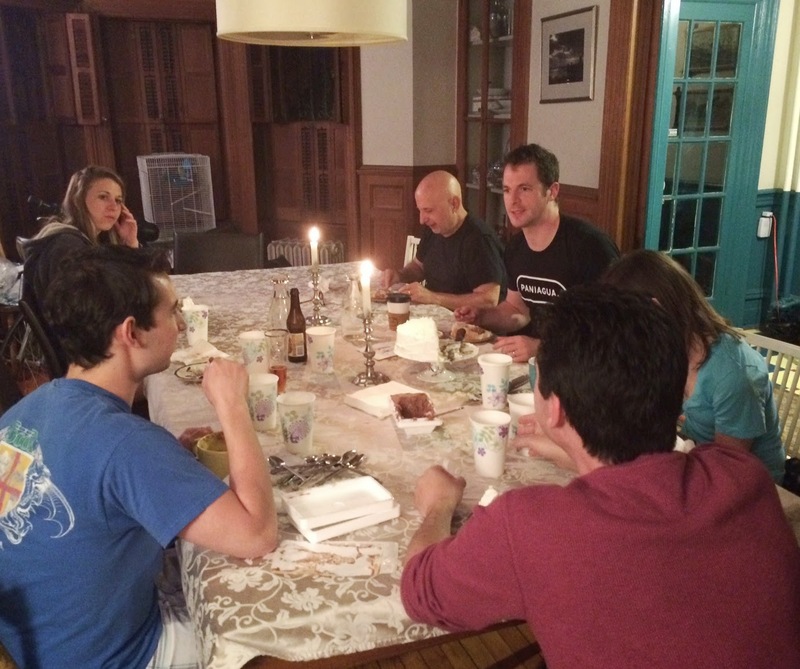 That soda bread [subject of my most recent blog post] is stale!" she complained. And just as we all revert to our childish selves when dealing with our parents (no matter if we're grown-up), I reverted to "dedicated employee" when confronted with a boss-figure. Lyn, this one's for you! 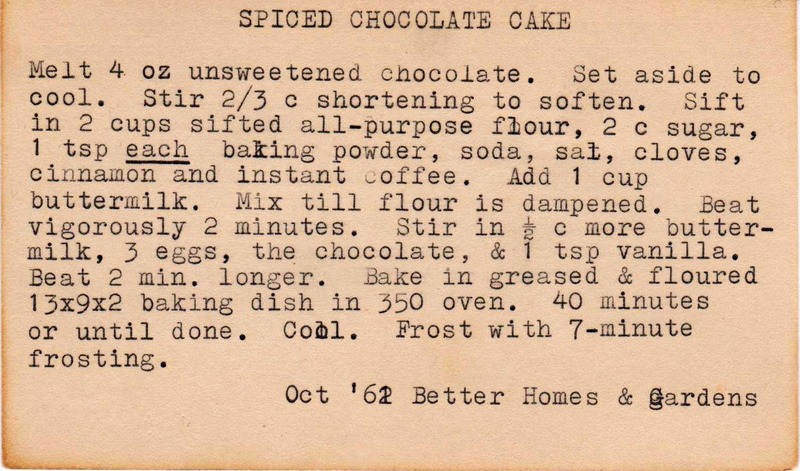 This vintage recipe for Spiced Chocolate Cake is the perfect showcase for the island's bounty. It's very easy to make and actually tastes better the day after it's baked. Melt unsweetened chocolate in a double boiler, or if you don't have one either, simply fashion one from a saucepan and a bowl. Just make sure the water in the saucepan doesn't touch the bottom of the bowl. 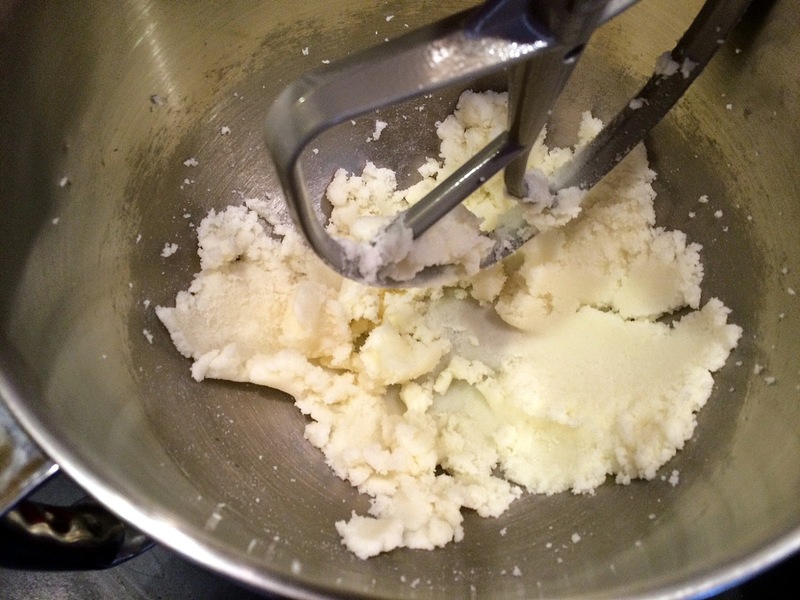 Stir (or sift) the dry ingredients into a mixing bowl, along with the room-temperature butter. Follow the instructions and add the rest of the ingredients. Mix it all together. Don't let the chocolate cool too long as I did (note the bits of chocolate in the batter -- they shouldn't be there, but it didn't spoil the cake). 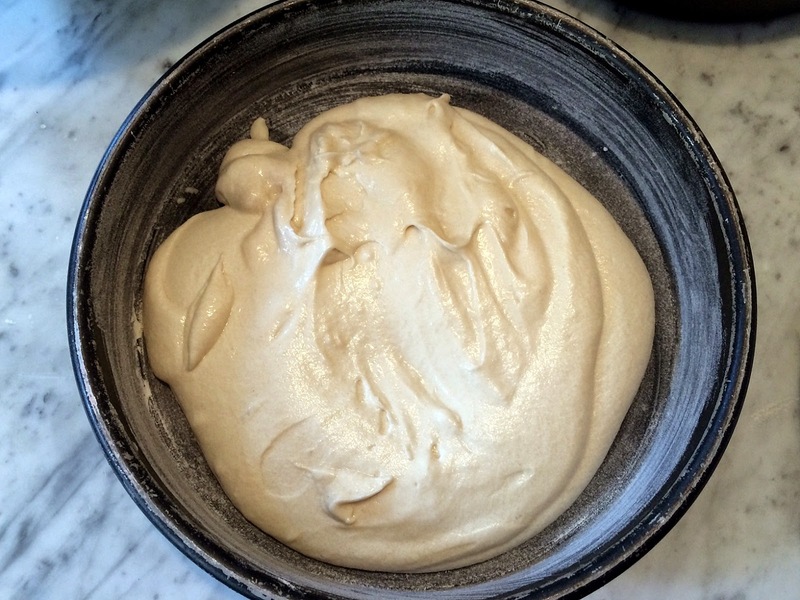 I used a modern-day version of a seven-minute frosting. Production notes: I followed the recipe exactly, but I let the chocolate cool too long before adding it to the batter, so careful not to do that. 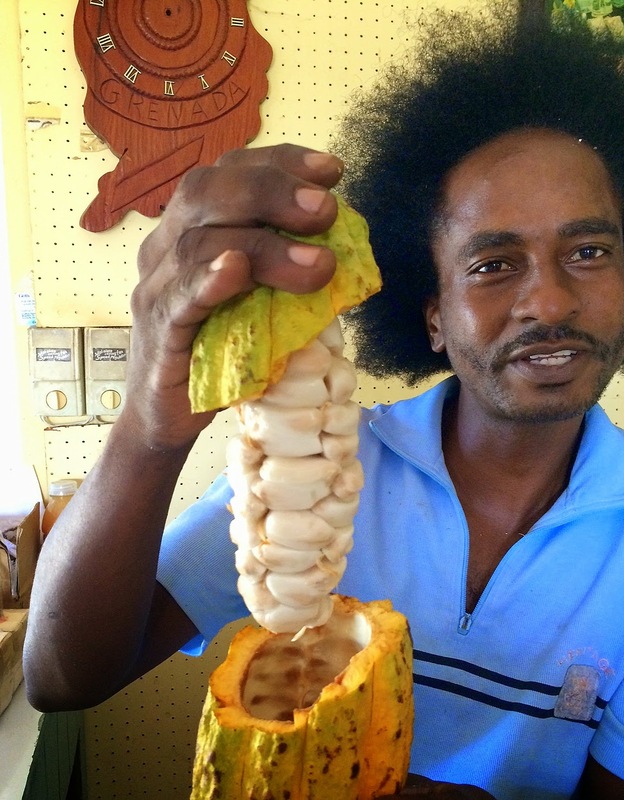 A cocoa pod. The raw fruit tastes like melon! 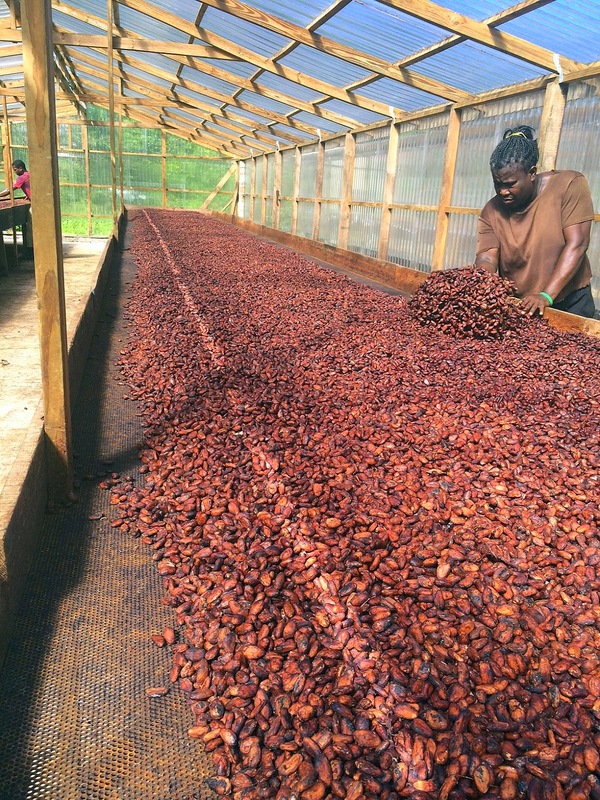 Cocoa processing at the Belmont Estate. 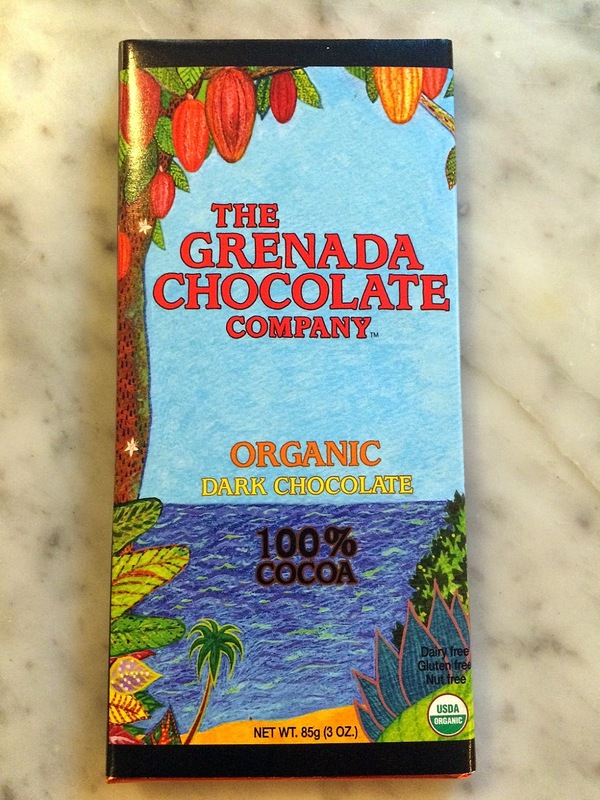 The cocoa fields are just a few yards away, and the chocolate factory is down the road. 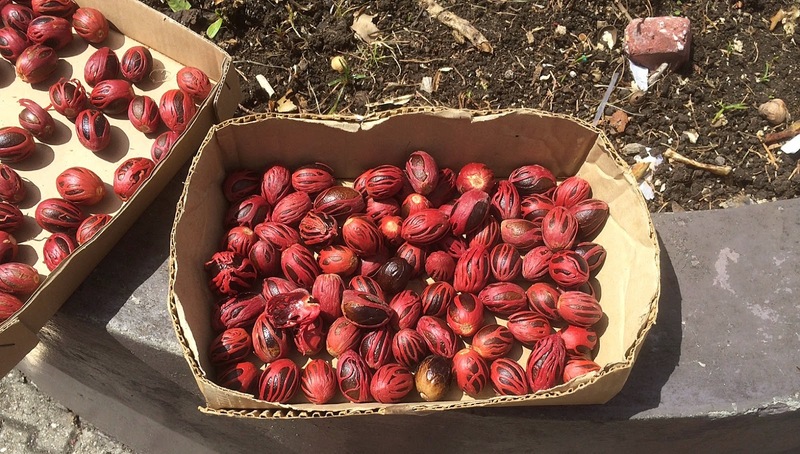 Nutmeg for sale on the street in St. George's, the main town. The web-like red coating is mace. 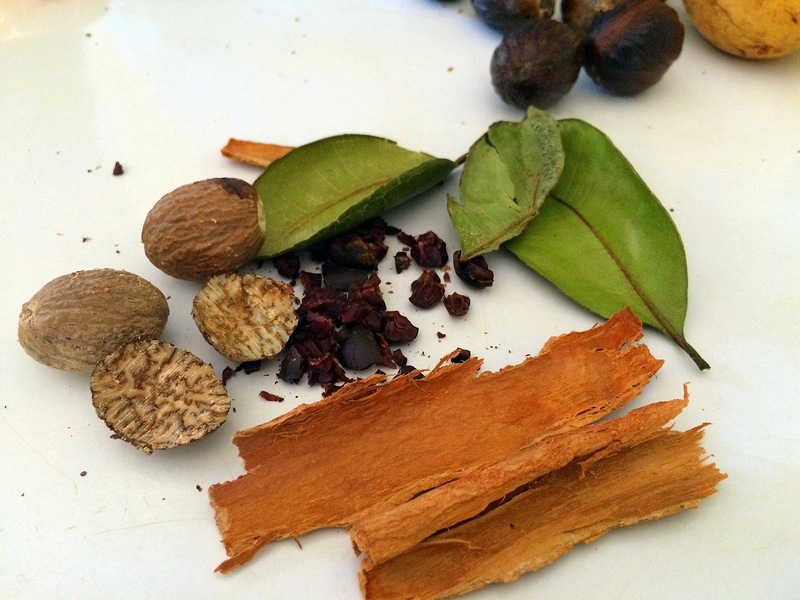 Nutmeg, bay, cocoa nibs and cinnamon, which is harvested from the barks of trees that grow all over the island. 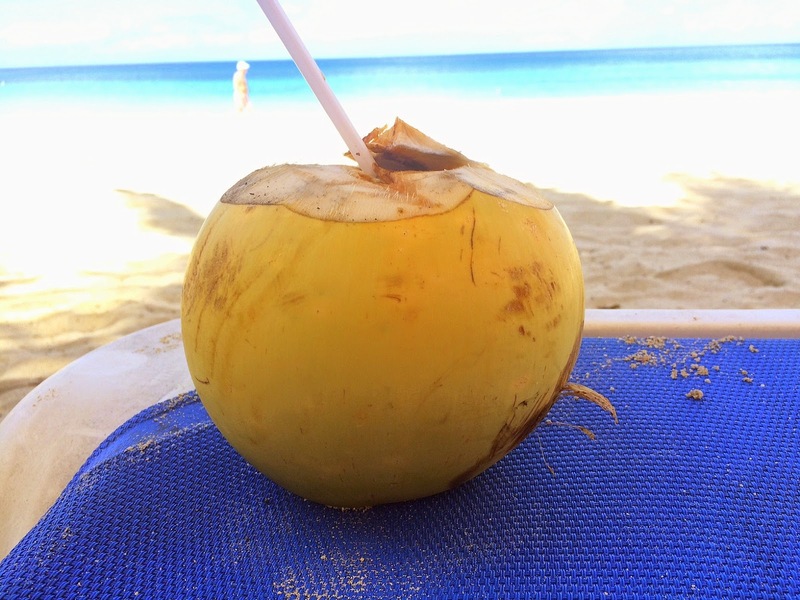 When I asked for coconut water, this is what I got! Not exactly the bottle I expected, but quite refreshing. I despise duplicity and deception (but apparently not alliteration) except on April Fool's Day. 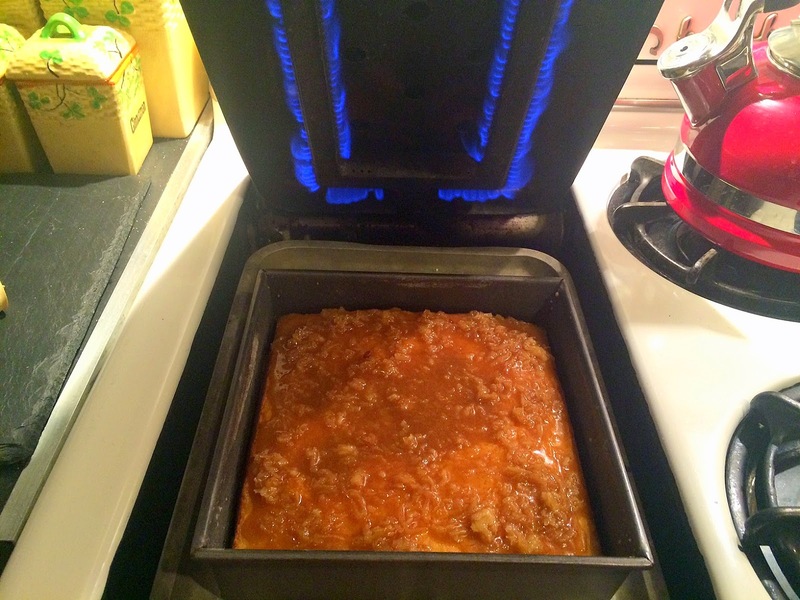 So, I bring you a delightful kitchen-born practical joke -- and a delicious one! 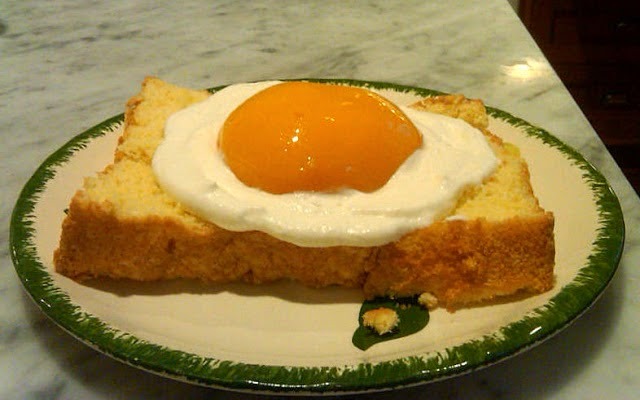 The fried egg on toast pictured above is trompe l'oeil at its best. 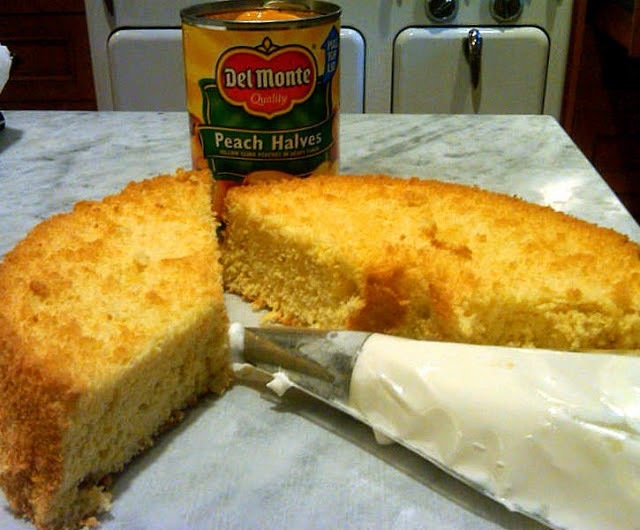 In fact, it is a canned half peach surrounded by whipped cream on a slice of sponge cake. 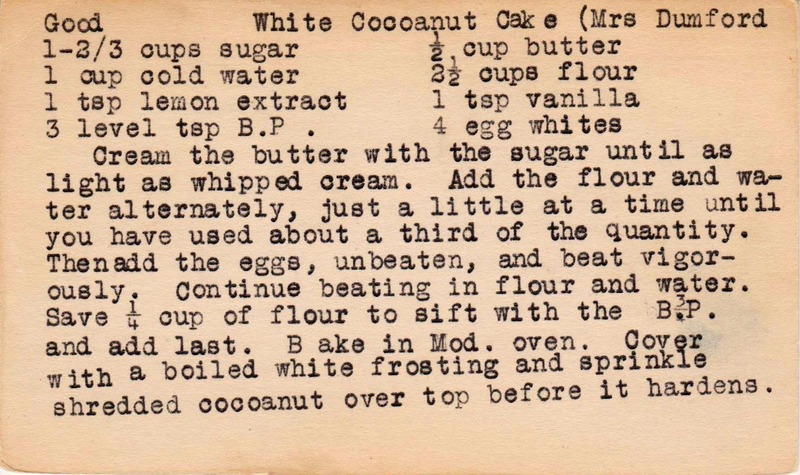 I found this gem of a recipe in a 1956 spiral bound cookbook (simply called Cook Book) published by the women of Circle "B" of the First Brethren Church.